What is better than a teh o ais limau on a hot day to quench your thirst? Today’s recipe will be a soap inspired by it. If you are looking for an activity for the weekend or looking to make a handmade gift, this recipe will make a beautiful soap which is perfect. Use Soaplab’s handmade transparent soap base. It will act as a cleanser as well as keep the skin hydrated and moisturized. To recreate the refreshing aroma of a teh o ais limau, mix in Oatmeal, Milk and Honey fragrance oil with Mandarin Lime fragrance oils for the ‘limau’ scent. 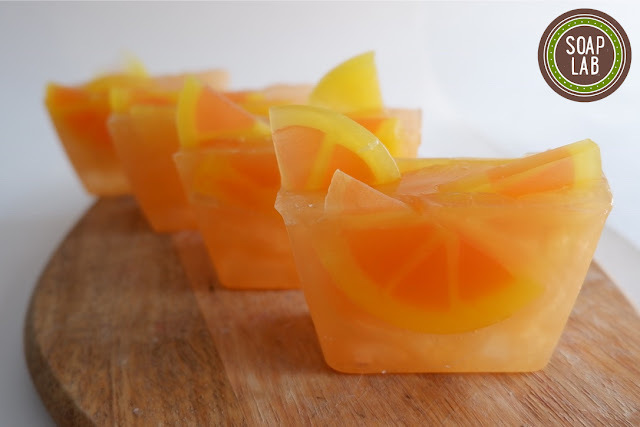 Finally, add in melt and pour limau soaps made the day before (similar to this recipe; change color for limau), transparent soap cubes that would look like ‘ice’ and sparkle gold mica. There you have it! Your very own Teh O Ice Limau Soap! Using a kitchen knife, cut SoapLab’s Transpparent Soap Base into small cubes. The smaller the cube, the faster it will melt. Next, add in Mandarin Lime Fragrance Oil. Add in Sparkle Gold Mica that has been diluted with glycerin into the container. Using a spatula, mix the soap until mica & oils are fully incorporated. Spray mold with some rubbing alcohol. Add in “ice cubes” (cubes transparent soap base) into the mold. Gently pour soap mixture into the mold, covering the “ice cubes”. Now for some “limau” :) Add some limau shaped melt & pour soap into the mold. Leave soap to harden for about 12 hours.